Which Boiler Do I Need? We will carry out an on-site survey and discuss with the client Current needs from there Heating System and take into consideration any future expansion that may be required. From the survey we will only recommend an installation that is suitable. Please call us to arrange a free survey and quotation for any new gas appliance. There are three main types of high-efficiency condensing boiler- the combination or ‘Combi’, the system and the regular. Each type delivers the benefits of high-efficiency technology, but is suitable for different types of homes. Combination or ‘combi’ boilers heat your home and provide instant hot water without the need for a cold water storage tank or a hot water storage cylinder. Combi boilers are an increasingly popular choice in UK homes and in fact, account for well over half of all the new domestic boilers installed in Britain every year. 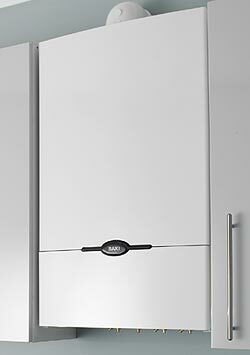 Regular boilers are suitable for homes with a traditional heating and hot water system. Unlike a combi, regular boilers work on the principle of stored water and require a separate hot water cylinder, which determines how many bathrooms can be supplied. Regular boilers require more space than either combi or system boilers as they often require an external circulation pump and an expansion tank in the loft. System boilers also use stored water which allows them to feed several hot water taps at a time, making them ideal for large homes. In contrast to regular boilers, system boilers have most of their major components of the heating and hot water system built in, making them more efficient and less space consuming.